Rhosfach historic landscape character area lies on the southern, gentle south-facing slopes of Mynydd Preseli at between 270m and 200m. 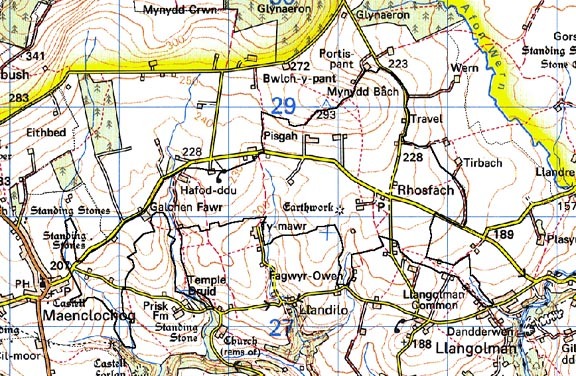 Most of the area is enclosed farmland, but there are pockets of unenclosed common - Llangolman Common, Llandeilo Common, Maenclochog Common and Rhosfach Common. The enclosure pattern is one of small irregular fields, but there are some long strip-shaped fields in the eastern part of the area. Boundaries mostly comprise stone and earth banks topped with hedges. Apart from those that flank roads and tracks the hedges are in a very poor condition - either entirely gone or represented by straggling lines of bushes and small trees. Wire fences on the banks provide stock-proof boundaries. Land-use is a mixture of improved pasture, unimproved pasture and rough grazing with rushes, gorse and scrubby woodland on the commons. Apart from the small trees in the overgrown hedges and the scrubby woodland, woodland is not a characteristic element of the historic landscape. 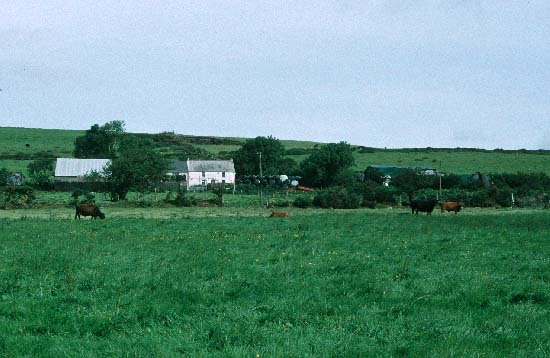 The settlement pattern is one of dispersed farms and cottages. Dwellings are predominantly 19th century, in the vernacular style, stone-built (cement rendered and/or bare stone), three bays, one, one-and-a-half and two storeys, with slate roofs. It is likely that the cement rendering on some of these dwellings masks earth (clom) construction. The single storey cottages are a distinctive element of this landscape. There are a few late 20th-century houses in a variety of styles and materials. Generally agricultural buildings are small, reflecting the size of the holdings. They include single small, stone-built 19th century ranges; mid 20th-century corrugated-iron barns and other structures; and small late 20th-century steel-, concrete- and asbestos-built structures. There are no listed buildings in this area. Transport routes consist of narrow winding lanes and tracks flanked by high hedge-banks. Recorded archaeology is fairly diverse and includes a possible neolithic chambered tomb, a bronze age cremation, a scheduled round barrow and two possible further barrows, and one definite and three possible standing stones. There is a scheduled iron age hillfort (or medieval motte), and a further possible hillfort. From the medieval period is a mill site, and from the post-medieval period four quarries including Mill, Galchen and Vagur quarries, and a world war two military camp near Maenclochog.